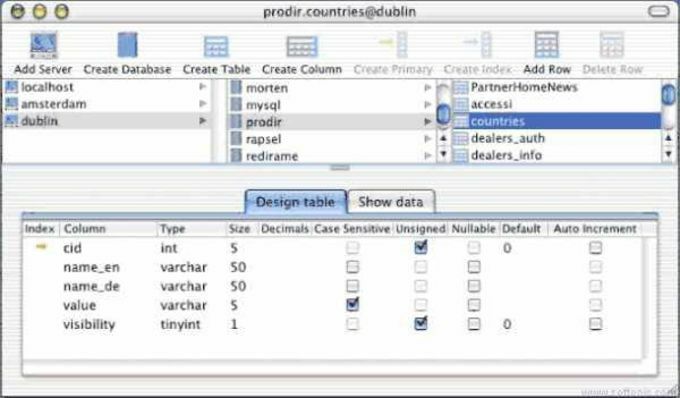 YourSQL is a useful, free Mac program, that is part of the category Development with subcategory Database. Since we added this software to our catalog in 2005, it has already achieved 2,450 downloads, and last week it gained 1 download. This software is available for users with the operating system Mac OS X and former versions, and you can get it only in English. The current version of the program is 1.8.0e and was updated on 6/09/2005. About the download, YourSQL is a slick program that takes up less space than many programs in the category Development. It's a very popular software in France. YourSQL is a simple but powerful program to create and manipulate MySQL databases. It is intended to be easy to use for the beginner as well as the more advanced user, and provides access to some otherwise underused, advanced features of MySQL, such as indices, InnoDB tables, multi-statement SQL scripts and multi-threaded handling of SQL dumps for backups or similar administration tasks. What do you think about YourSQL? Do you recommend it? Why?